Ooff! I haven't posted in a while, but I haven't exactly been idle. 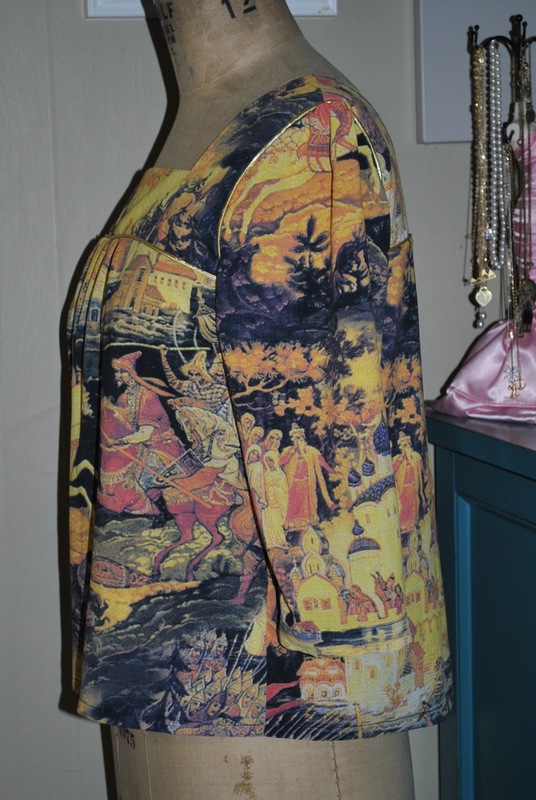 I took two Sunday classes at Nancy's Sewing Basket and had two major breakthroughs: a fully lined, all-machine vent, and the perfect pattern for a Chanel jacket. I made my samples and my muslin, but making a dress with the lined vent and making the Chanel jacket is still in my future. A very near future, I hope. Instead, what I really felt like doing during the last couple weeks was using a few very special poly prints from my stash. 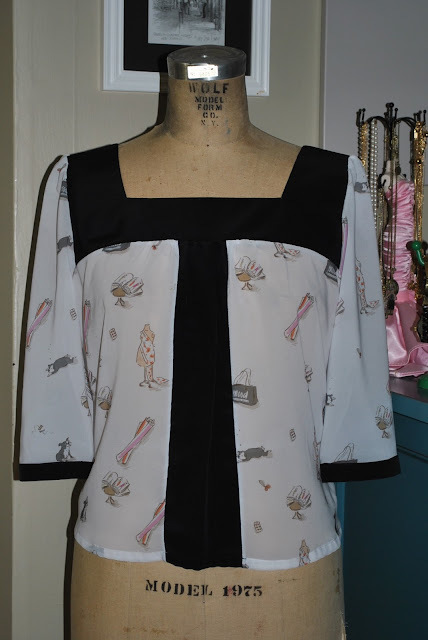 I wanted to practice some more with New Look 6284, to perfect the pattern for a Peter Pan collar, and to work with piping. And here are my results :) Fair warning, this is going to be a long post. 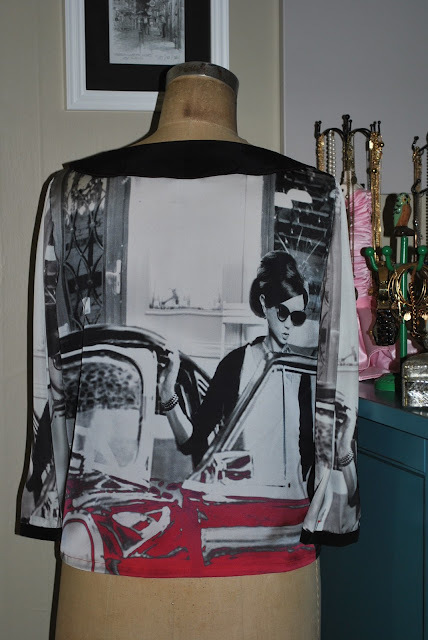 First, here's a very bold print that I found at Nancy's last year. It came in panels. I bought 4 panels (front, back, and two sleeves) and combined it with a nice black poly with a beautiful drape. 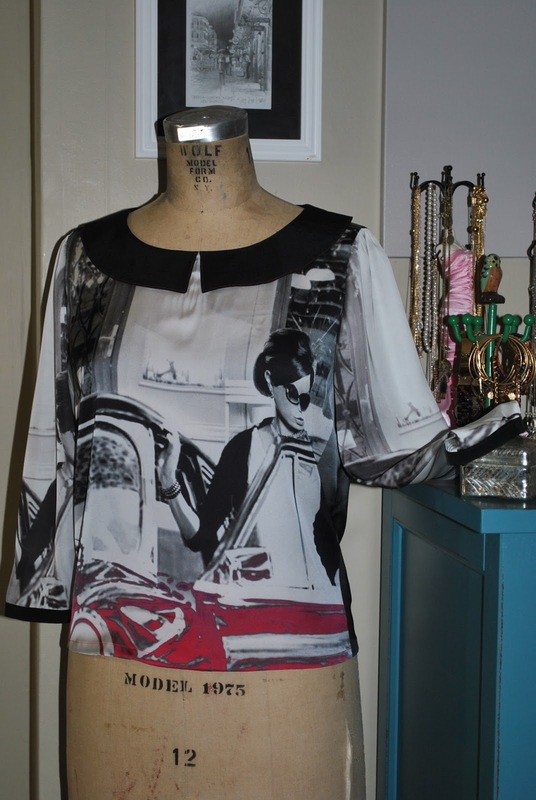 This top will look great with black pants or jeans, and my black Rebecca Minkoff gold chain bag. I'm not sure if you can see it here, but since the print has some red at the bottom, I added a red top stitch to the edges of the collar. Next, we have a lovely chiffon print from Mood :) it is literally an homage to Mood Fabrics. I have some more of this print coming and there's another even bolder version that I got (if you like it, buy it fast because it's already been sold out once!) so I'll definitely be making something else with this one. But for now, a little color-blocking and voila! It's very sheer, so a cami underneath is a must. Next, come my experiments of working with piping. I've never tried it before and what I've discovered is that a zipper foot is key when it comes to adding piping to a garment. 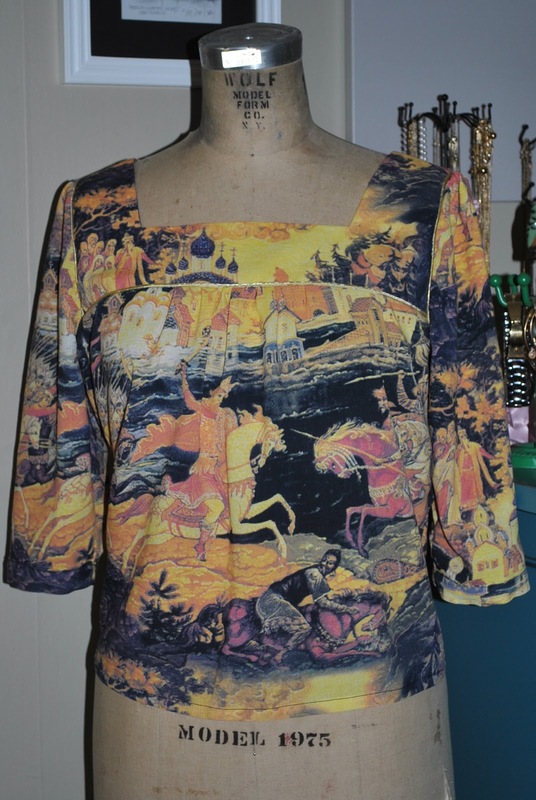 And finally, the piece de la resistance :) I found this gorgeous Russian folklore print in Stitches on Capitol Hill. I bought it months ago and all this time I've been unsure of what to do with it. But once I did the top above, it occurred to me that some gold piping is exactly what this print needs. 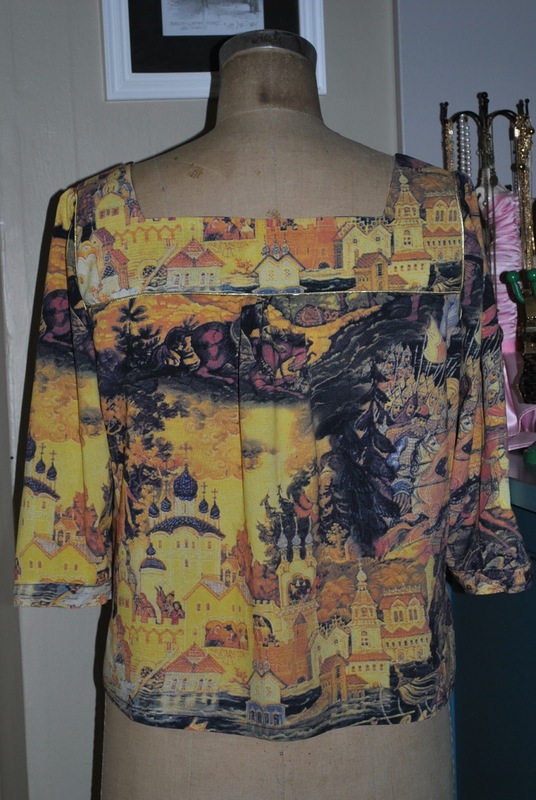 It's so unique, with the Orthodox churches' onion domes, and Russian knights (витязи) charging at each other on horses with swords, and of course a couple of Russian fair tsarevnas :) I'm in love with this top. 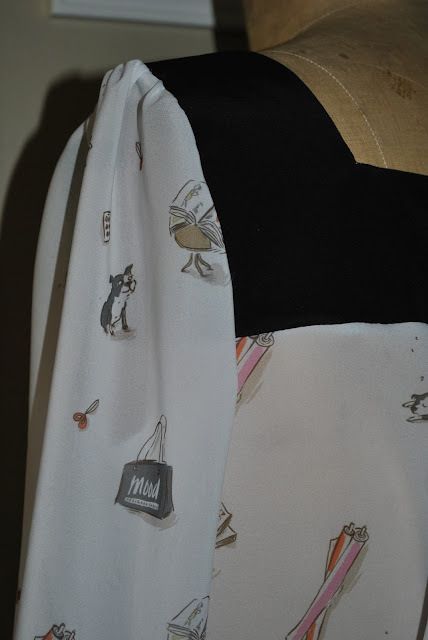 In fact, I'm seriously thinking of buying some more of this fabric (if they still have it!) 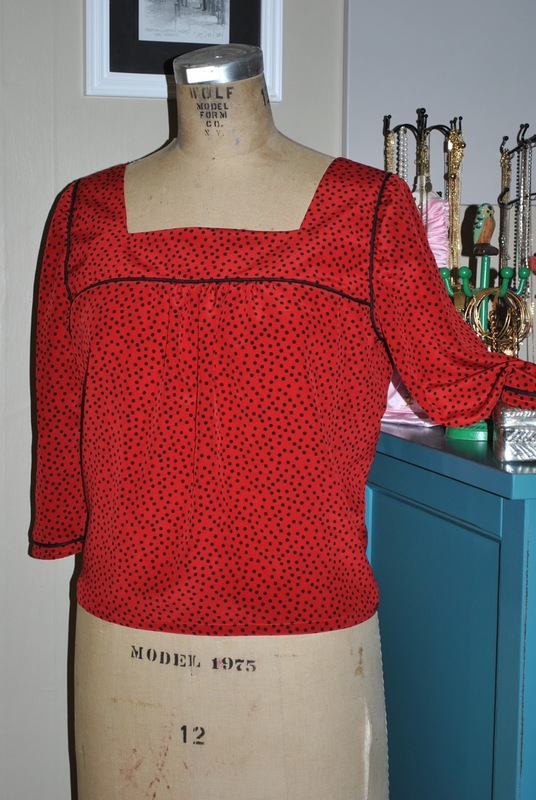 and keeping it to recreate this top once this one is worn out. 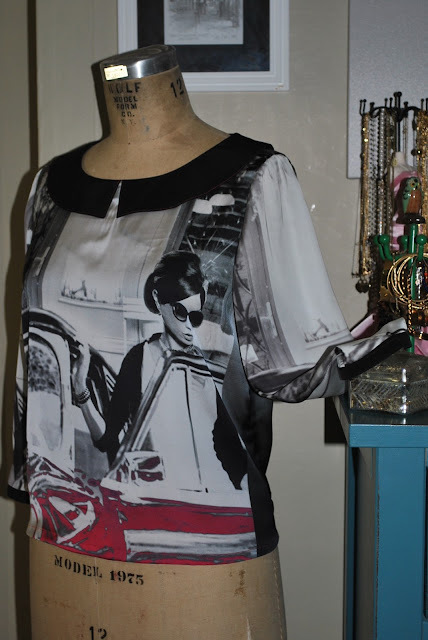 In these pictures, I tried to capture this print in all its glory and richness. The piping is added to the front and back panels and around each arm hole. Cutting this one was a lot of fun! As you can see, this pattern has two front parts and two back parts. I'm glad I had well over two yards to select exactly what I wanted to feature in the front and the back. 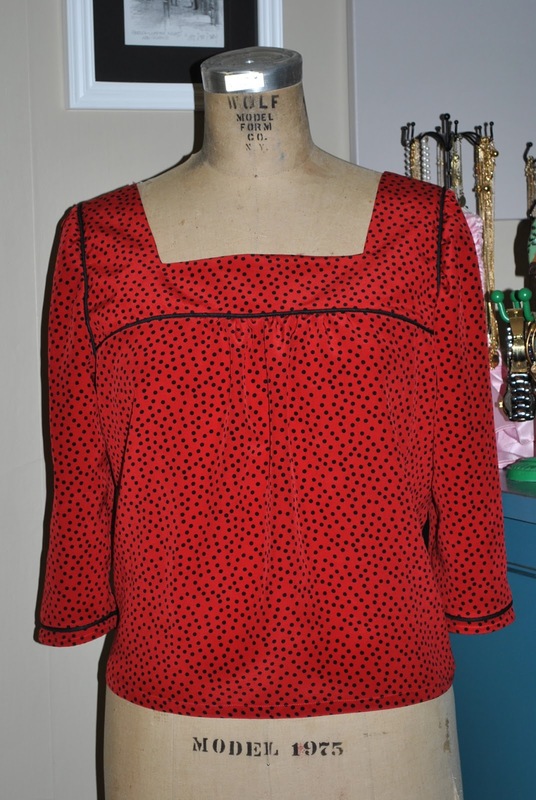 I love the Russian top, make a sheath dress from it, it's going to be awesome!